The S.I. Newhouse School of Public Communications is participating in the first National News Engagement Day, created by the Association for Education in Journalism and Mass Communication (AEJMC). Events to encourage news engagement are planned throughout the Newhouse School and across campus on Tuesday, Oct. 7. Participants will learn more about the news, have fun and win prizes, including a GoPro camera. Follow on Twitter at #NewsEngagementDay. 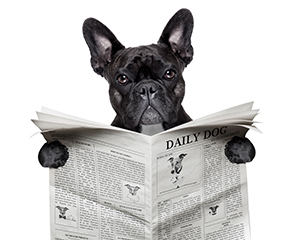 Everyone is encouraged to become a newshound on National News Engagement Day. A complete listing of events is available online at http://newhouse.syr.edu/NED.